Play the latest online UK slots at Wizard. Find out if you’ve got the Luck of the Irish with this Irish-themed progressive online slot from the creative minds at Eyecon. It has to be said that there are a number of Irish-themed slots on the market, yet Eyecon has still managed to bring something unique and immensely playable to the market. Spell ‘I-R-I-S-H’ across the five-reels to win a shot at the progressive jackpot, or spin three leprechaun symbols to trigger Prize Pack. The slot’s appearance is that of a traditional Irish pub which is apt given that Luck of the Irish is a feature-packed slot game with cash prizes worth celebrating. Come find new slot games here from this developer. Eyecon started life as a gaming company in Brisbane back in 1997 before deciding to apply their creative talents to the online casino market. Fast-forward and Eyecon have since accumulated a stable of over 70 games loved by gamers the world over like Fluffy Favourites Fairground. It was recently announced that Eyecon would be joining Playtech in a deal reportedly worth £50 million. This means that we should be enjoying innovative Eyecon games for years to come. 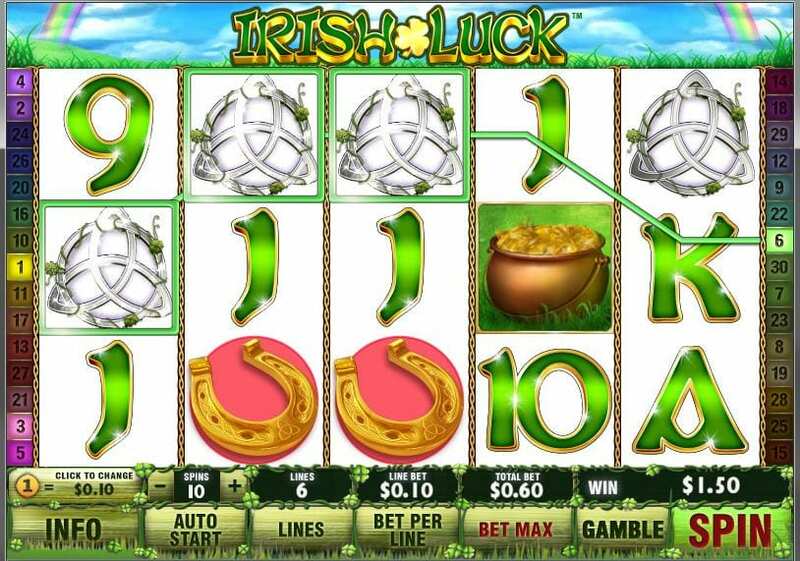 The Irish theme of Irish Luck Jackpot is executed with good-spirited sound effects and a well-chosen array of symbols including a pint of Guinness, a mushroom and a tree stump hiding a pot of gold (presumably belonging to a leprechaun!). However, it is the four-leaf clover wild symbols that you’ll want to keep an eye for as these substitute for all symbols except scatter fairies. Wild symbols also double any winning combination in which they appear. We have prepared a helpful content with a list of slots games and more. Match & Win - Three or more fairy scatter symbols award the lucrative Match & Win bonus with magical cash prizes to be won. The more scatters you find, the greater your prize will be. Prize Pick - Spin three or more lucky leprechaun symbols to trigger the Pick Me bonus which gives you up to 100x your stake. What’s more, spot a leprechaun behind your picks to win some free spins. I-R-I-S-H Jackpot Shot - The eagle-eyed might have noticed letters appearing across reels one to five. If you manage to spell ‘I-R-I-S-H’ then you will be awarded a shot at the huge progressive jackpot… this is where Irish Luck Jackpot really shines. Although Irish-themed online slots are something we have seen before, Eyecon has executed it perfectly here. That tasteful choice of Irish emblems for symbols, as well as the old world feel of the game board, set the scene. The thoughtful touches don’t just apply to the game’s appearance, as four-leaf clover wilds pay double in any winning combination - an unusual but welcome feature. The Irish talk about ‘good craic’ and that’s exactly what you get with the Match & Win and Prize Pick features. That said, it’s the progressive jackpot which makes Irish Luck Jackpot stand out from the competition. If you liked playing Irish Luck Jackpot then be sure to try Paint.